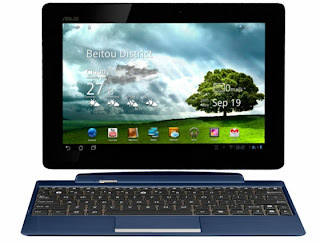 The Transformer pad TF300T is a mid range member of Asus's transformer line of tablets that are designed with a detachable keyboard dock in mind. I have not already done a review of this and seems like a good time now since it just got updated to Jelly Bean. The TF300T is made of a good quality plastic so it obviously doesn't feel as good as its big brother the transformer prime. There are no noticeable creaks or anything like that and overall the build quality feels good. The back of the tablet is textured with swirls which seem to make it a little easier to grip and the tablet is not too heavy even when the keyboard dock is attached. When docked onto the keyboard it feels very secure as the hinge is quite big and feels very sturdy (its size also lifts up the device at the back a little bit). The hardware in the TF300T is good, at its core is a 1.2 GHz Tegra 3 which can be bumped up to 1.3 GHz when the tablet is put into performance mode. The IPS panel on the TF300T is clear and crisp (above 720p) but it is not an IPS+ panel like on the prime so there might be some issues with viewing the screen with direct sunlight shining on the screen. The 1.2mp camera on the front of the tablet is perfect for all your video chatting needs and the 8mp camera on the back is perfectly acceptable if for some reason you are using a 10 inch tablet as a camera. The TF300T proves Asus were not lying when they said they would get Jelly Bean updates out to the transformer family as quickly as possible as it now runs Android 4.1! Asus don't add a massive amount of bloat or change an awful lot of things about stock Android. They add a few apps but some are useful (Supernote). They change the notification popup on the tablet to have some toggles for WiFi, Bluetooth and the 3 different modes (Eco, balanced and performance). Asus add some attractive widgets to the Android experience but unfortunately the email one only works with the email app and not gmail. The Jelly Bean update includes all the features you would expect from Jelly Bean like Google Now, Improved voice search and project butter. The tablet itself has a micro HDMI, micro SD and a proprietary charging/data/docking connector. The TF300T is the WiFi only model but there are LTE models available if you have LTE in your country. The dock extends your connectivity even more as it adds a full USB port and another of the proprietary connections for charging the dock or doing all the above with the tablet connected to the dock. Is the dock worth it? I think the dock is worth getting. It doesn't add an awful lot of bulk or weight, saves money on buying a kickstand, has its own battery which charges the TF300 once it hits 70% battery and you get a keyboard and touch pad as well. It also protects the screen (which is not gorilla glass) when you close it down like a laptop/netbook.